Q&A courtesy of Lexie Kelly. Photo and video courtesy of Deep Blue Media at the WOWSA, Lake Balaton, Hungary. Ferry Weertman of the Netherlands has won the last two major 10 km races - the 2016 Rio Olympics and the 2017 FINA World Championships - by the slightest of margins. He discussed his approach to competing at the highest levels. Daily News of Open Water Swimming: What did you do after winning your gold medal at the 2016 Rio Olympic Games? 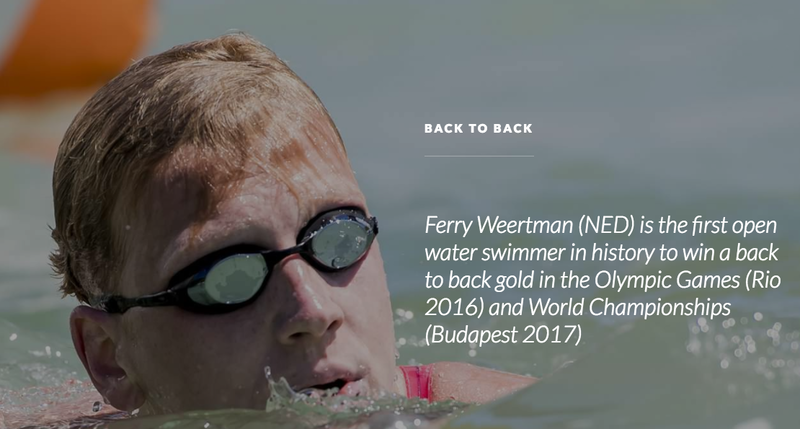 Ferry Weertman: After Rio, I took a long vacation and asked myself the following question, "Do I want to continue swimming and why? The answer for me is, "Yes, because I love swimming." Once I knew that, my coach and I made a plan for this year to be at my best again at the 2017 FINA World Championships. This plan wasn't much different from other years, but I did start going to school again after Rio. I had quit school two years before the Olympics. Daily News of Open Water Swimming: Your races at the Olympic and World Championships always seem to end in a sprint and photo finish. Do you like that drama and excitement of close races? Ferry Weertman: I love the excitement of the sprint, but I try to race to make my chances of winning as big as possible. I have a high top speed for an open water swimmer, so it mostly ends in a sprint for me. Daily News of Open Water Swimming: What do you think about in this hard-fought races coming down to a final sprint to the touch pad? Ferry Weertman: I'm seeking the best moment to start sprinting and once I start sprinting it's all out and going for the touch. Daily News of Open Water Swimming: What do you focus on while you are training - away from your rivals? Ferry Weertman: In training, I think of my opponents in general. Knowing that, I have to give it my all everyday because they are training hard as well. This really motivates me. Daily News of Open Water Swimming: What are some of your hardest workouts? Ferry Weertman: The toughest sets we do in the pool are the specific sets. We don't do them very often, but when we get close to a race, we always do a 6,000-7,000 meter set in which there is a lot of build, always ending with a 100m maximum at the end. And you know that even when you're tired that is when you have to make the difference. Daily News of Open Water Swimming: Do you do dryland training program? Ferry Weertman: I do dryland 6 times a week for half an hour. Its mostly for coordination, stability, flexibility and mobility. Some exercises are derived from yoga and others are just simple ab exercises.